Berlin walks a tightrope. It's a delicate balance. 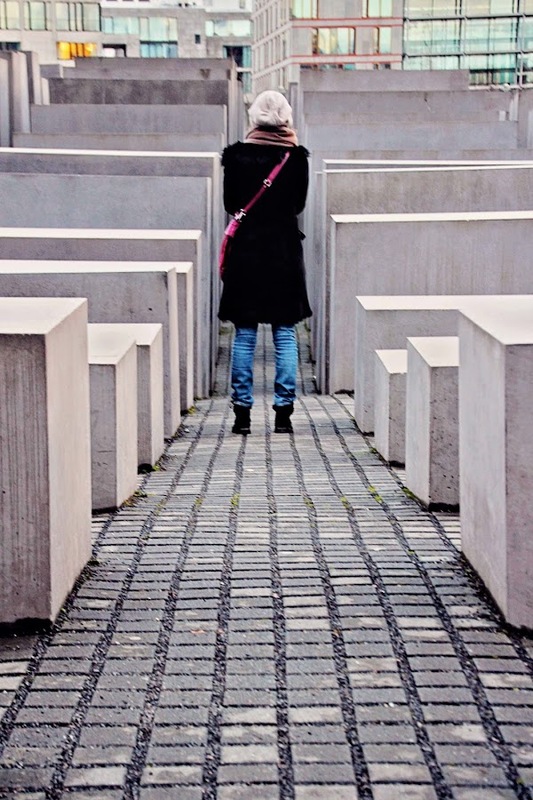 How do you remember and acknowledge your history, while not allowing the Nazi legacy to overshadow and obliterate everything Berlin has overcome AND become? 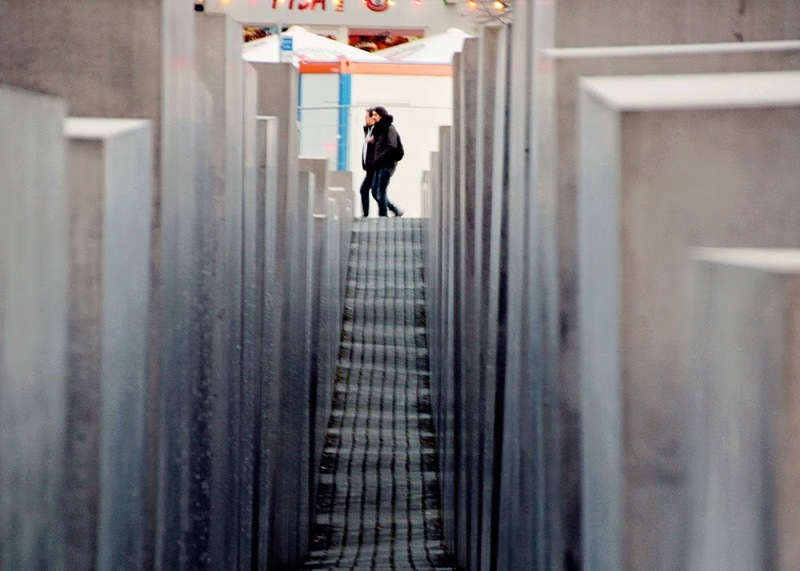 How do you honor the 6 million Jewish victims of the Nazi Holocaust? 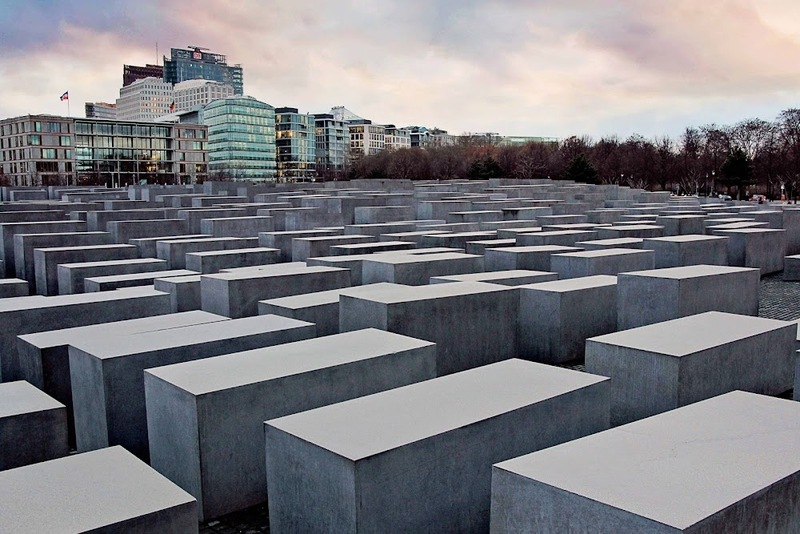 You hire an American in Paris Berlin to design the "Memorial to the Murdered Jews of Europe". 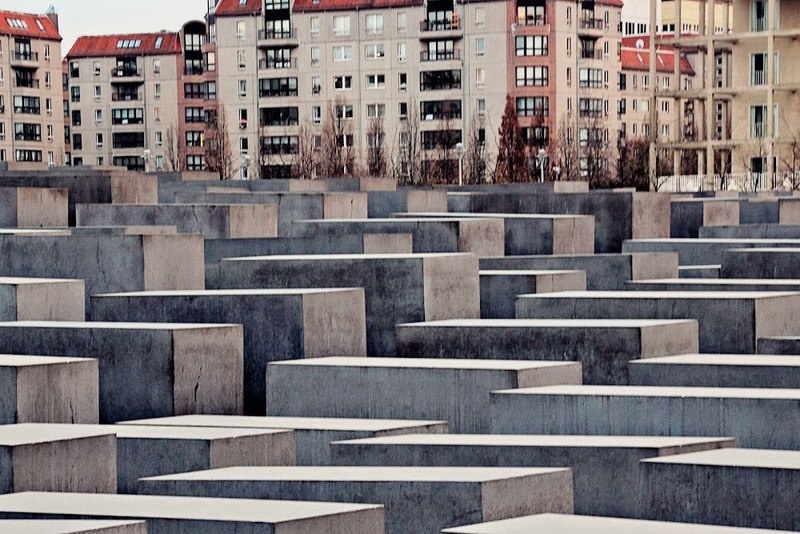 Aka, Berlin's Holocaust Memorial. 2,711 concrete slabs on a sloping 4.7 acres in the heart of the city. Mere footsteps from Hitler's bunker. 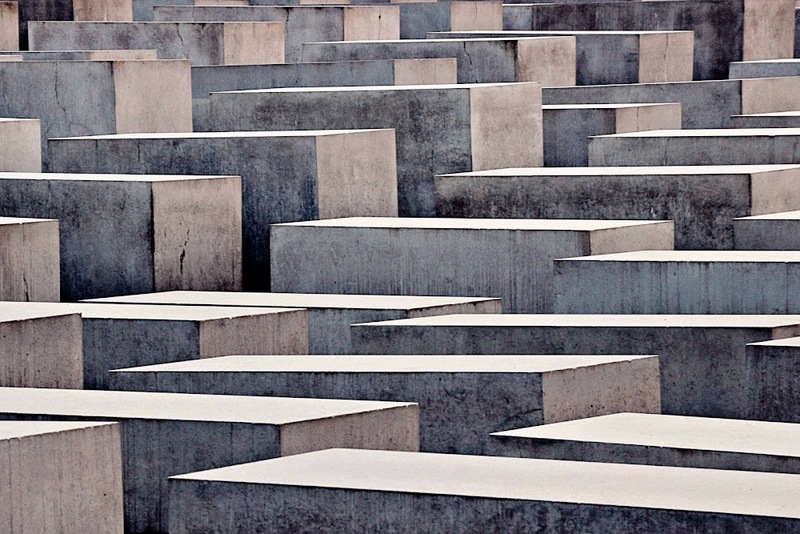 "Memorial to the Murdered Jews of Europe (at dusk)"
No plaques. No Inscriptions. No religious symbols. It's strength is in its mass of anonymity. All of whom suffered the same fate. The varying heights of the slabs coupled with their placement on a slope creates an undulating, uneasy, lost and confusing atmosphere. To walk the labyrinth of pathways between the massive stone slabs (varying in height from 8" to almost 16') results in disorientation. I'm sure that was the point. An ordered system that has lost touch with human reason. 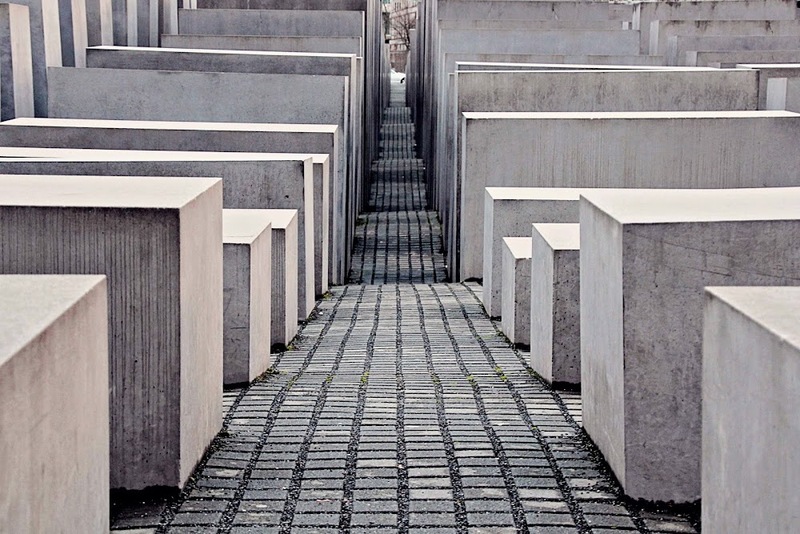 Some believe the design resembles a vast field of nameless tombstones. It's quiet. Eerily quiet. Others believe the design is too abstract. It's quiet. Eerily quiet. 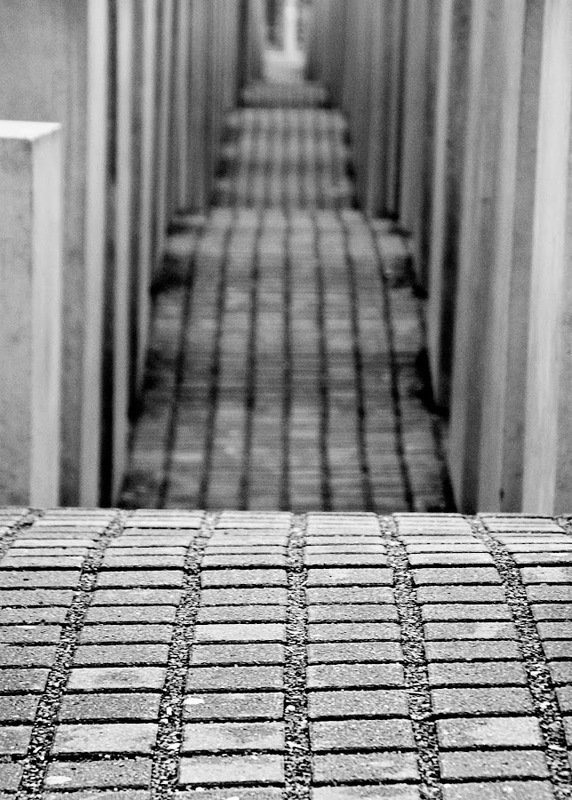 In my opinion, there is a brilliance to the idea that the design is as unexplainable as the Holocaust itself. Kinda the perfect way to walk that tightrope Berlin. Very powerful memorial, and I can only imagine that abstract was the point as it gives no instruction, only interpretation. Thank you for sharing this, very moving!! Great share! Looks a little eerie as you stated, but I still will like to see it up-close and personal. Goosebumps, Kathy. Thank you for sharing these, really. My daughter took some really cool photos there too. It's a powerful memorial. It does look eerily quiet. Great, moving images! Wow, I am not sure how we missed that. What an emotion evoking memorial--thanks for sharing! It gives an feel of unease - as any reminder of the atrocities should. Great set to share and perfect for 'balance'. Very interesting and sad. Yes it is eerie. Chilling & beautiful at the same time. I would think eerily quiet would be perfect. What a powerful and moving place. Your photos are quite fascinating. It is a chilling place and I admire the way it has been done. It was very controversial when it was constructed. Did you notice the " Stolpersteine" (stumbling stones) which commemorates the victims of the Holocaust? They are placed in front of houses where people were deported...a memorial against forgetting the victims. They are now to be found in many other countries in Europe. Your pictures are very impressive . These are really moving. I love the open to emotional interpretation of it all. I'm sure whatever you look for you can see. These are fantastic images and thank you for inviting us in to the experience. Quite amazing and interesting to see this memorial. One I have never seen . Thanks for sharing!